Lunchable streamers are an excellent deep diving fly fishing pattern. They imitate all sorts of minnows and baitfish that you may find in the water, which makes it a fantastic and effective fly pattern to have. This is one pattern that will not disappoint. The Lunchable Streamer Assortment features 8 Lunchable patterns in size #2 in brown and white. The Chubby Lunchable streamer is better suited for dark and murky water, the Lunchable minnow is perfect for bouncing around large boulders and tight spaces fish congregate. 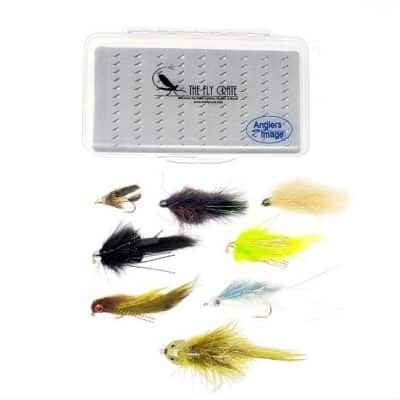 The Baitfish Lunchable streamer is a deep diving streamer for bright and clear conditions. Size #2 is a perfect, ‘Goldilocks’ size for streamers that isn’t too large and is not too big. These flies can be fished comfortably with a 5-weight as they will be for a 10-weight fly rod. Strip one of these flies back towards you in the water and you’ll pull up a fish. Tied out of premium materials and name-brand Mustad hooks, these flies can withstand dozens of strikes. These flies have become a world-renowned go-to fly for trout.